The Minister of Energy and Mineral Development, Eng. 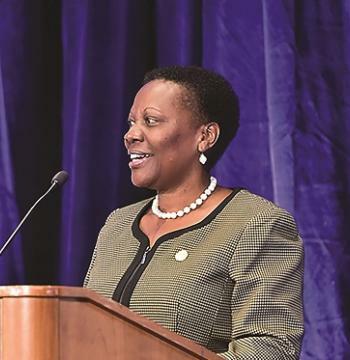 Irene Muloni has assured Ugandans that they will take up some of the jobs in the oil and gas sector as supplies, saying foreigners will only be offer services and products that Ugandans cannot provide. The minister made the pledge during the first National Content Conference for suppliers in the Oil and Gas Sector in Uganda organised by the Petroleum Authority of Uganda (PAU) at the Speke Resort and Conference Center Munyonyo, Kampala. Eng. Muloni re-echoed government’s approach to National content, which, she said has been articulated in the existing Policy, Legal and Regulatory frameworks, including the Local Content Policy, 2018, which was passed by Cabinet in June 2018. The conference brought together all companies that have expressed interest in supplying the Oil and Gas Sector during the year 2019. Ernest Rubondo, the CEO of PAU said the conference was arranged to update the suppliers on the latest development in the oil and gas sector but also help them network in bid to cooperate in the provision of services and products. The major objective of the conference is to take stock of the journey that the successful Ugandan companies have gone through, in providing goods and services to the oil and gas sector. Uganda is currently described by the World Bank as the hottest inland exploration frontier in the world and the country to watch in the oil and gas space, due to the commercial discovery of an estimated 6.5 billion barrels of oil, 2.2 billion of which are recoverable. First oil is expected in 2022-23. The country alongside partners intends to construct a crude oil pipeline from the oil wells in Hoima to Tanga Port in Tanzania. The construction budget for the 1,445 kilometres pipeline is to consume US$3.5 billion, part the Ugandan side will consume about US$700 million, according to planners. The pipeline is planned to have a capacity of 216,000 barrels of crude oil per day. It will be 24 inches (61 cm) in diameter. Uganda also signed an agreement with a consortium, including a subsidiary of America’s General Electric, to build and operate an oil refinery in western Uganda that will cost US$3 billion-US$4 billion. Kabaale International Airport in Hoima district is under construction. It is part of the infrastructure under construction as the country prepares to develop its nascent petroleum industry. When completed, the new airport will facilitate mobilization of equipment for construction of the oil refinery and assist in the development of agriculture and tourism in the area.